There were days when Triplicanites could easily identify every league Cricketer playing at Marina ground ! ~ and tell history of them too .. .. those days we were fascinated to see a Singh playing at Marina – and my neighbour coolly added – it was Satwender Singh whose brothers Kripal Singh & Milkha too played at a higher level and their Ram Singh was one of the leading all rounders of his time, playing 2 unofficial tests !!! 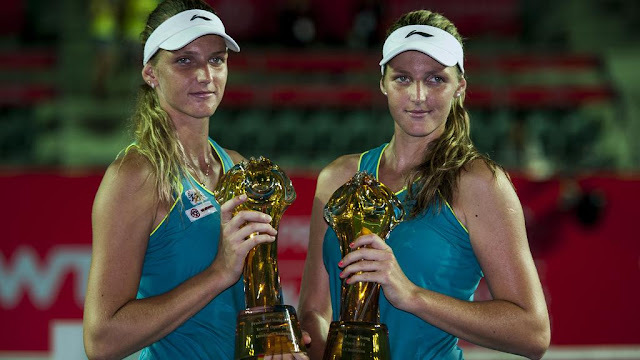 Tennis followers might well know the twins Bob & Mike Ryan – and the attractive Pliskova sisters - Karolina Pliskova and her identical twin sister Kristyna. For easy identification, we have the tattoos,” Karolina said. Karolina sports two tattoos – on her left thigh and left arm – while her sister has one. “She is a lefty and I am right-handed, and we have different hair. Karolina was in news for wrong reasons !! How to explain what transpired in the third set of Rafa’s 6-1, 1-6, 6-3 win over Alexander Zverev in Rome on Sunday? With Rafa down 1-3 in the third set and seemingly out of answers against Zverev, a storm conveniently swept across the Foro Italico, forcing a prolonged delay in play. When that delay was over, Nadal had answers again. He charged through the last five games for his eighth title in Rome, and reclaimed the No. 1 ranking in the process. Zverev had a real chance at victory, up an early break in the third set, before rain threw a curveball into the match, allowing Nadal to reset and win the final five games. It was a high-quality final, with several long, grueling rallies bringing the Italian crowd to their feet in appreciation of the effort and impressive shot-making of both players. There were 24 rallies that went at least double digits (10 shots), totaling 313 shots in the court by both players. Perhaps what made Rafa win was his temperament and firm belief that he could win though he was almost out of the match ~ and he remained cool ! Rafael Nadal may have stumbled in his bid to sweep all four “Big Titles” on clay, a feat he accomplished in 2010 when he won the Rolex Monte-Carlo Masters, the Mutua Madrid Open, the Internazionali BNL d'Italia and Roland Garros. Nadal fell to Dominic Thiem in the Madrid quarter-finals earlier this month. But the 31-year-old Spaniard has still added two more Big Titles – a combination of Grand Slam, ATP World Tour Masters 1000 and Nitto ATP Finals crowns – to his haul as the European clay-court season enters its final three weeks. Nadal came out on top in a matchup of this year's top two clay-court players Sunday, beating defending champion Zverev 6-1, 1-6, 6-3 Sunday to win a record-extending eighth Italian Open title. Coming a week after a loss in the Madrid Open quarterfinals to Dominic Thiem, Nadal has his confidence back entering the year's second Grand Slam in Paris, which starts next Sunday. "It's been an amazing week," Nadal said. "It was tough losing in Madrid so to come back and win the trophy here is great." Perhaps the question heading into next week's French Open should be: "Who can take a set off Rafael Nadal?" instead of "Who can beat Nadal?'" The Spaniard, dubbed the "King of Clay," is the white-hot favorite to land a record-extending 11th title at Roland Garros. Take this stunning statistic: Nadal owns a 79-2 win-loss record at the French Open, where the best-of-five set format makes the 31-year-old even harder to defeat. He's only lost to Sweden's Robin Soderling in the fourth round in 2009 and Novak Djokovic in the quarterfinal in 2015. But if there is to be a monumental upset at the French Open, who might be on the other side of the net? There could be a sudden blackhorse, which doesn't include the absent Roger Federer. As great athletes age, the first thing we look for is evidence of physical decline. The cliche is to talk about the “half-step” that has been lost, rather than inquiring about their psychological state. Yet even sporting legends can be worn down mentally by the accretion of small failures over the years, and the fear that certain opportunities may never come around again. Grey matter is as susceptible to the march of time as muscle fibre. “It is not a question of tennis,” Nadal said once after his defeat by his compatriot Fernando Verdasco in Miami. “The thing is the question of being relaxed enough to play well. Recently, World No 5 Karolina Pliskova lost her cool over a line call and bashed a hole into the umpire’s chair with her racket after suffering a 3-6, 6-3, 7-5 defeat by Maria Sakkari in the Italian Open second round. Pliskova had argued heatedly with umpire Marta Mrozinska after her smash was called out when serving at 30-30 and 5-5 in the final set, and her Greek opponent won the game before serving out the match. The Czech exchanged a brief word with Sakkari at the net before approaching Mrozinska with an outstretched hand before withdrawing it and repeatedly smashing the chair with her racket. Pliskova’s twin sister Kristyna, who also ranks in the world’s top 100, slammed Mrozinska on social media. “The worst i have ever seen @wta and i hope this lady Marta Mrozinska will never ever judge any match of me or Karolina again #blacklistforever,” the 26-year-old wrote on Twitter.